OPEN Forum provides small business owners with insights, ideas and resources to help them grow their businesses. American Express has the tools and resources to help their small business customers grow, but their online community and resource hub OPEN Forum was suffering from declining engagement. Customers said the long-form articles didn’t feel solution oriented and they weren’t easy to take action on. Articles also didn’t connect to a larger theme or learning opportunity, so there wasn’t much incentive to return. AMEX needed a new approach to their product and content strategy. Their digital agency, Kettle, hired me to design the product vision. User research allowed us to narrow in on a few key themes for product exploration. How might we make complex topics easy-to-digest? In order to discuss topics intelligently with others, customers wanted multiple perspectives at a glance. In what ways might our content suggest next steps? Customers were action-oriented and looking for solutions to their problems. How might we better use the content we already have? In order to better serve customer needs, we needed take the raw ingredients and create a new recipe. Based on our user research and how might we statements, I explored new ways to package OPEN’s wide breadth of content. I arrived at a concept allowing OPEN to repurpose their existing standalone content organized into new framework called Action Cards. 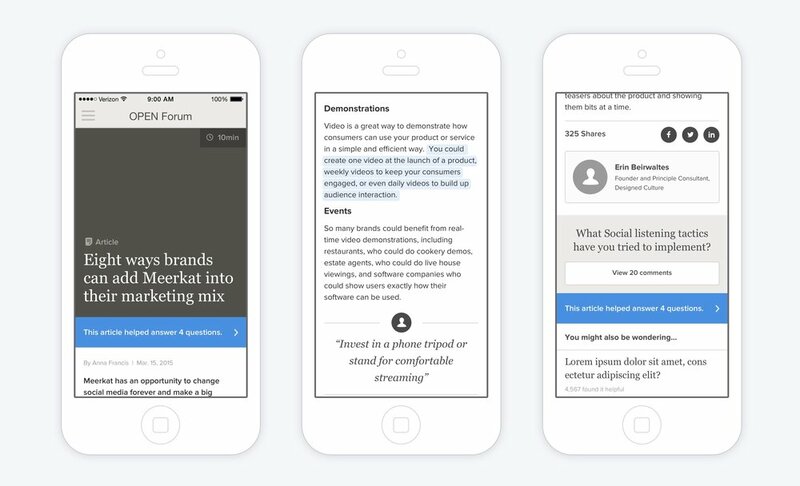 Action cards answer common questions using snippets curated from standalone content. They allow customers to quickly parse information at-a-glance, and prompts them to take action. The flexibility of action cards allow AMEX to package existing content in a more meaningful way, and provide a clear framework for future content strategy. 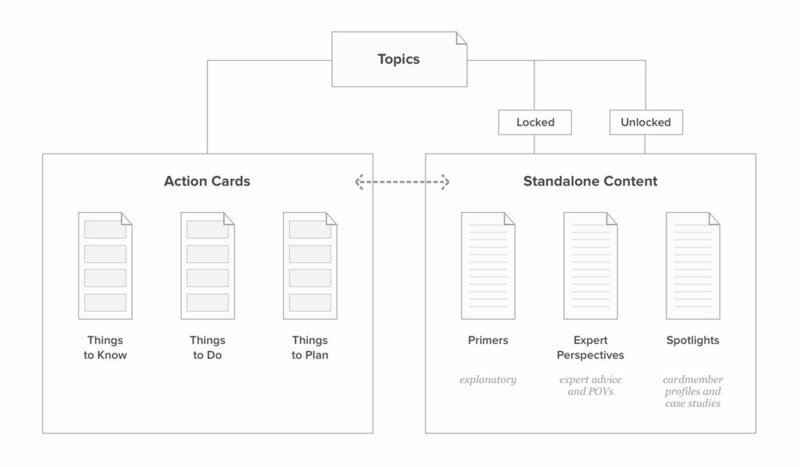 Article pages link to parent action cards so users can easily dig deeper. Question prompts allow customers to engage with content and save their progress. Expert spotlights provide trust and exclusive access to cardmember-only content.